This week’s minorities in cartoons entry is “Captain Planet and the Planeteers.” Debuting in 1990 on TBS, the series ran for six seasons. The series was created to promote environmental awareness among youths watching. It was one of the first major cartoons to do so. Gaia gave five special rings to five different youths from around the world. Each ring possesses a special elemental power. By combining their five rings’ powers, the Planeteers can summon “Captain Planet,” a mullet-wearing superhero (I know…it was the early 90s). Cap possessed the standard Captain Marvel/Superman-style superpowers (flight, strength, super-speed, etc.). Cap would use his powers to quickly take care of situations too much for the individual Planeteers to handle, usually while spouting off a few situation-appropriate puns. Unfortunately, Captain Planet’s chief weakness is excessive levels of pollution. High levels of hate (such as those by Hitler…long story) can also disable him. When Cap’s around, the Planeteers’ rings are non-functional. Kwame, a Black African (from Ghana, per Wikipedia) who serves as the group’s de facto leader. His ring has the power of “Earth,” allowing Kwame to generate small earthquakes, shift pieces of the ground, drill through the ground, and other seismic effects. Gi, from China (per Wikipedia). Her ring has the power of “Water,” which lets her control water to various effects (creating waves, waterspouts, etc.). Gi also has an interest in marine biology. Wheeler, a Caucasian youth from New York. Wheeler has the power of “Fire,” allowing him to generate flames or control fire to various degrees. The least environmentally knowledgeable member of the group (but well-meaning), Wheeler also tends to be impetuous. Wheeler sometimes tries to (unsuccessfully) flirt with fellow Planeteer Linka. Linka, from the Soviet Union (later changed to “Eastern Europe” post-USSR breakup). Linka has the power of “Wind,” letting her generate or control wind. Ma-Ti, from the Amazon rainforest in South America. Ma-Ti has the power of “Heart,” which usually allows him to communicate telepathically with people and animals, as well as instill a sense of empathy in others. He also has a pet monkey named Suchi. Hoggish Greedly (presumably, despite nothing else in common, a pun on the name of 19th century American figuure Horace Greeley) is an obese, greedy businessman who tends to be wasteful in his industries’ operations. Looten Plunder engages in weapons dealing, etc. Dr. Blight misuses science for typical mad-scientist ends. Duke Nukem (no relation to the video game) is a walking radioactive mutant who misuses nuclear power for his own ends. As I noted in my Earth Day post, while the show was well-intended, it could sometimes take a heavy-handed approach to its lessons, or come off as rather preachy. Thus, the series was subject to plenty of parodies in the 90s and 2000s. 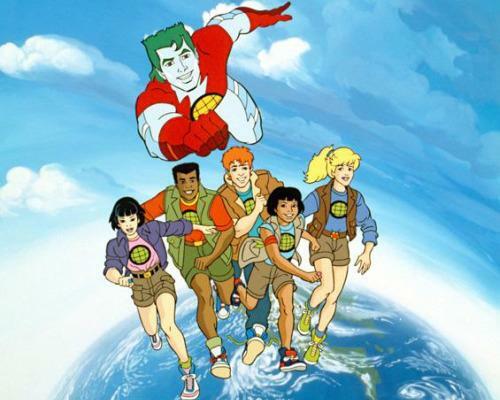 That said, “Captain Planet” did break ground in various ways aside from its ecology focus. The Planeteers are a diverse group. “Diverse” in this case meant more than just adding one Black character to an otherwise all-Caucasian cast, as was common in animated series at the time. The cast (including Gaia and Dr. Blight) has various female characters, most of who’d pass the Bechdel Test. The sole Caucasian/American protagonist, Wheeler, isn’t presented as the show’s default star (beyond appealing to American viewers) or as the leader of the group. Linka represents a positive portrayal of Eastern Europeans/Soviets during the (late) Cold War, a rarity in American media of the time. Even rarer might be Kwame, who’s one of the few Black African recurring characters in American animation. The series also features some celebrity voice artists. LeVar Burton (Geordi LaForge of “Star Trek: The Next Generation”) voiced Kwame. Whoopi Goldberg voiced Gaia in earlier seasons. Latter seasons saw Margot Kidder (Lois Lane in the 70s/80s “Superman” movies) voice Gaia. Next Post:Off to the 2013 C2E2!